A Biodigester simply means a tank which digests organic material biologically. In this sense, the FilterPod is a biodigester. However, many people think of a biodigester as a tank which digests, anaerobically, without air, organic material and produces methane gas for cooking, lighting and heating ect. The composition of the gases produced by this type of biodigester is about 60% Methane, 30% Carbon Dioxide and the rest is Hydrogen Sulphide. However, for a Biodigester to produce enough methane to make it practical for cooking alone, it would require all the household waste and toilet waste plus more manure from large farm animals. The Intergovernmental Panel on Climate Change (IPCC) estimates that an average biodigester tank produces 25.5 g of methane per user per day, which is not enough even for cooking a one-pot evening meal. As most UK households do not keep cattle or pigs, small scale Biodigesters are not practical in the UK. Biodigesters are, however, superb solutions for rural agrarian communities, intensive livestock farms, towns and cities where the large volumes of domestic and animal wastes can produce significant quantities of methane. In rural areas, biodigesters are built in settlements where there is adequate animal manure. In Indian villages larger units are made to serve a number of families or even a whole village. In China, where most rural families keep numerous pigs, the one family unit is common. To produce 1 m3 of BIOGAS, to cook 3 meals daily for a small family of 4 you need at least 5 litres of pig manure/day. 8 large pigs (breeding adults) will produce 5+ litres/day. 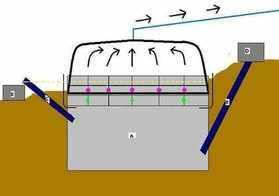 An example of a simple biodigester for animal manure is shown below. 'A typical simple biodigester is shown above. A is the biodigester tank where a water and manure mixture is digested by methane producing anaerobic bacteria. Cow manure is a lot more fibrous than pig manure, therefore the dilution rates are different. If human and cow manure is being used in a biodigester of this size (1.9 meters deep X 1.5 meters wide X 3 meters long), you need to add 40 litres of water and 20 litres of manure every day. When working with pig manure you add, 20 litres of water for the same 20 litres of manure. As you can see, you need a lot of pigs to make the methane for a single house! 1.A household which does not keep large livestock will not have enough nitrogenous organic material to make a biodigester worth installing. 2.The optimal temperature for a biodigester to work properly is 38°C This is difficult to achieve in the UK. 3.The organic material passing through is not heated enough to totally destroy all disease causing pathogens. A small percentage of the eggs of some cattle and human diseases may collect in the sludge. 4.Biodigesters produce a highly flammable and toxic gas, therefore it is essential that at least one member of the family is thoroughly conversant with the system and capable of immediate repairs. 5.Modern cleaning products, bleaches, antibacterials, etc. kill the anaerobic bacteria in the biodigester. This is not a great issue in developing countries, but is a much greater one in the UK. At the moment, there is not a small scale biodigester available for purchase in the UK, though the technology may be viable for equestrian households, dog boarding kennels, smallholdings and families with a large, continuous amount of garden waste material.